Architectural LED lighting can serve buildings and structures in a nearly limitless variety of ways. As reported throughout this blog and found in many other places, bridges and buildings can use LED lighting to emphasize the building’s existing features, help the building standout against its surroundings, highlight the natural beauty of the area, and many more possibilities. Retailers have found LED architectural lighting particularly handy for drawing attention to their storefronts in bright and creative ways. 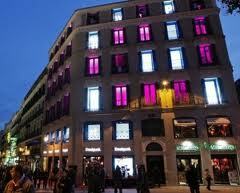 According to Chauvet, the clothing retailer, Desigual, installed in their flagship store in downtown Madrid one hundred of their LED wash modules,lighting seven floors of the building’s striking 21,500sqft façade which opens onto Madrid’s Callao and Preciados shopping districts. The effect created by Chauvet’s wash units is alluring, reaching out to the shoppers and pedestrians outside with rich light, even color, and captivating color changing. BulbAmerica has a wide range of Chauvet’s LED products and LED washes so check them out today and use them to bring to your business the attention it deserves. As usual, leave a comment or question on our Facebook or blog or call our team of lighting experts at 1-877-622-0897 with any concerns you have.